Michelangelo Antonioni is one of the great visual artists of the cinema. The central and distinguishing strength of Antonioni's mature films, Seymour Chatman argues, is narration by a kind of visual minimalism, by an intense concentration on the sheer appearance of things and a rejection of explanatory dialogue. Though traditional audiences have balked at the "opacity" of Antonioni's films, it is precisely their rendered surface that is so eloquent once one learns to read it. Not despite, but through, their silences the films show a deep concern with the motives, perceptions and vicissitudes of the emotional life. This study covers films not dealt with in any other book on the great director, including Il mistero di Obertwald (1980) and Identificazione di una donna (1982), which have not yet been seen in the U.S. Its coverage of the early documentaries and features, when Antonioni was forging his new and original stylistic "language," is especially full. In a free-ranging analysis of the evolution of Antonioni's style that quotes liberally from Antonioni's own highly articulate writings and interviews, Chatman shows how difficult it was for the filmmaker to liberate his art from the conventional means of rendering narrative, especially dialogue, conventional sound effects, and commentative music. From his first efforts to his triumphant achievements in the tetralogy of L'avventura, L'eclisse, and Il deserto rosso, Antonioni's acute sensibility struggled to achieve the mastery that has won him a secure place in film history. 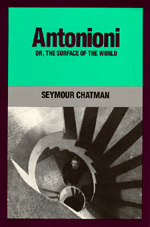 Chatman's study is the only complete account of Antonioni's work available in English. Its novel visual approach to the films while attract not only film scholars but also readers interested in painting and architecture—both important elements of Antonioni's work. Seymour Chatman is the author of Story and Discourse: Narrative Structure in Fiction and Film. He is Professor of Rhetoric and Film at the University of California, Berkeley. Much of his research for this study was done in Rome at the Centro Sperimentale di Cinema.